This vegetable-based Shed Control Conditioner softens, detangles and enriches coats while reducing excessive shedding and dander. Organic fair trade shea butter, glycerin and allantoin act to nourish the skin, as well as lock in moisture to reduce dryness and scaling. Powerful antioxidants, including green tea extract and omega-6 fatty acids, help protect the skin & repair skin damage which can trigger shedding. 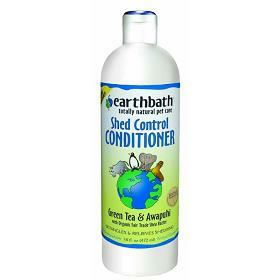 Earthbath Shed Control Conditioner is guaranteed to leave pets’ coats incredibly soft and shiny.